The 13th edition of A complete course in canning is ready for distribution for those interested in the canning, glass packing, and aseptic processing industries. This book has been totally revised and updated by Dr Donald Downing. The books are a technical reference and textbooks for students of food technology; food plant managers; product research and development specialists; Food equipment manufacturers and salesmen; brokers; and food industry suppliers. The three books contain a total of over 1650 pages. Dr Donald Downing, Professor of food processing, New York Agricultural Experiment Station, Cornell University, Geneva, New York, has brought together many subjects, heretofore unpublished, as a unit. 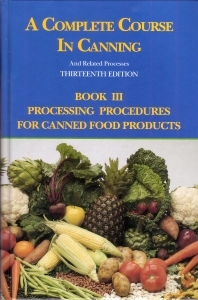 The objective was to make the books so comprehensive that they cover all phases of processing and so complete that they could be used as textbooks in food technology courses, as well as reference manuals and instruction books for all the food processing industry, lay individuals, as well as the professional food technologist. This new edition has been totally revised and expanded over previous editions, having new sections, new products and processes, and covers subjects from creating a business plan and planning a food processing operation, through processing and into the warehousing of the finished product.